Alexander Hahn’s new book Mathematical Excursions to the World’s Great Buildings explores a wide range of mathematics and architecture. 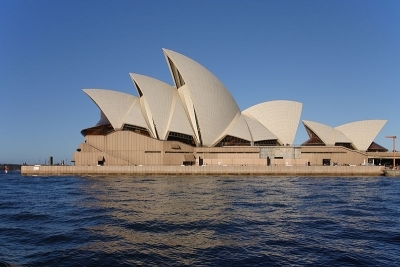 Here I’ll quote a little of the book’s discussion on how Danish architect Jørn Utzon came up with the geometry of the Sydney Opera House. Parabolas (or more accurately paraboloids, given the three-dimensional aspect of the vaults) were Utzon’s first choice for the profiles of the vaults. … At a later point ellipses (or again more accurately, ellipsoids) were considered. For reasons that we will explain shortly, neither of these geometries provided a buildable option. The restriction on the shape came from the ribs supporting the shells. The large size of the shells meant that they would have to be constructed in sections or components. The demands of economy and time meant that these components would have to be pas produced. A parabolic or elliptical shell would not do because then each rib would curve differently. Utzon’s flash was the realization that a limitless variety of curving triangles could be drawn on a sphere. So all the shells for the roofs could be designed as curving triangles from the same sphere! This was the idea that saved the project … exactly five years after the official announcement that he had won the competition. I was surprised to read that the shells are simply made of spherical triangles, all of the same radius. I expected something more complicated. My favorite concerning mathematical architecture is still the Tensile structure of the Olympic Stadium in Munich http://en.wikipedia.org/wiki/Olympic_Stadium_(Munich). I once saw a documentary of it by Marcus du Sautoy – really impressive and still revolutionary! Hmmm…. If you zoom in on your picture, you see lines looking like longitudes and latitudes. So pieces corresponding to the same latitude could be mass produced, but a different mold would be needed for each latitude. Is this optimal? Could you cover a shell-like part of a sphere with sections made from fewer molds? Jorn Utzon’s wooden hemisphere, from which he cut spherical triangles to scale, still exists, though I’m not sure where it is. There’s footage of it here around the 1:10 mark.